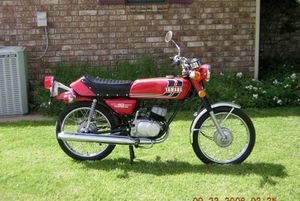 The Yamaha RD60 is a motorcycle produced by Yamaha from 1973 to 1975. 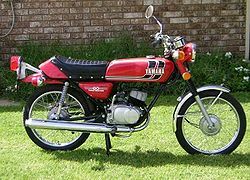 The Yamaha RD60 was a 55cc, single cylinder, two stroke, street motorcycle manufactured by Yamaha and imported from 1973 through 1975. 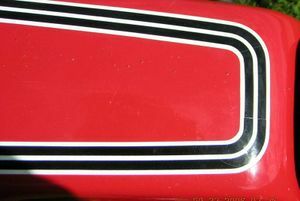 The RD60 was the the junior member of the Yamaha RD Series. 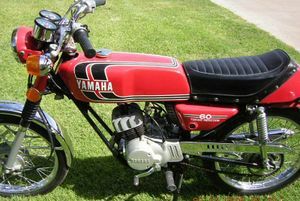 The Yamaha RD-60 had a 5-speed manual transmission. 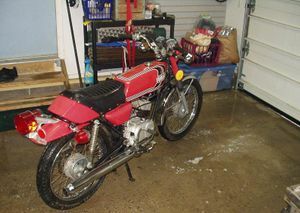 The machine below is a '74/75 vintage, it's not my motorcycle - although mine is identical to it) a relatively small number were sold. 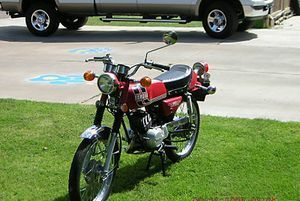 For such a small motorcycle it is surprisingly capable, it's 5 speed gearbox and manual transmission let you use all the ponies it has, which according to a period test is about 4. The engine red line is 10,000 RPM, and you'll want to keep it revved up as it makes almost no power below 6000 RPM. For as small as it is it's surprisingly comfortable with a fairly compliant suspension and well padded solo seat so extended rides are not completely out of the question. 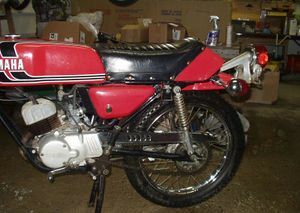 The motorcycle is equipped with a full electrical system with lights and turn signals as well as a comprehensive set of gauges including a large speedometer and tach with a turn signal and high beam indicator lights. Interestingly this model did not come equipped with a green neutral indicator. The RD-60 is also equipped with Yamaha's Autolube, premixing oil and fuel is not necessary. Autolube oil capacity 1.1 quart. Tire Size: 2:50 x 17 Both front and rear. Once aboard everything is right where is should be, the shift pattern is standard as are all the controls. 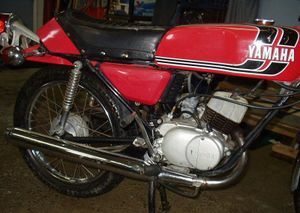 The engine should start easily and is fairly quiet for a 2 stroke engine from that time period. Open the throttle and let the clutch out the limitations of the 55 cc engine become obvious. 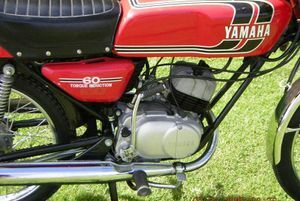 Yamaha elected to only provide this engine in a mild state of tune, rpm's build at a leisurely rate until about 5500 RPM then the little tiddler comes on pipe and..builds rpms at a slightly faster rate. You will not be going anywhere in a big hurry, although in some distance the little machine will readily reach speeds of 45 or 50 MPH providing the ground is level, hills put a big dent in it's style. Speaking of hills the bike will go up most steep hills in low gear at a 10 MPH or so. I haven't found a hill yet it couldn't climb. 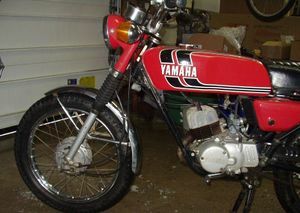 Yamaha states it can climb an 18% grade. Economy was the name of the game with this little bike, Yamaha states in the owners manual that it will get 188 MPG at a steady 18 MPH! In reality fuel mileage is right in the 90 to 110 MPG range. Thirty-two years later not much is available for this little bike from Yamaha, so for use as a daily rider at this point is not recommended, tires for the RD-60 are very scarce and any body parts were unobtanium 20 years back, so if you need repair parts you will need a great deal of luck to find it. Sometimes you can find a listing for an RD-60 part on line. 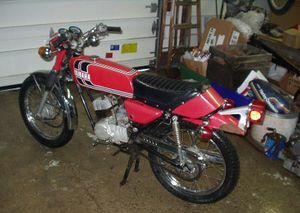 Definitely a budget collectible with prices for good bikes right at the $1500 mark, junkers are worth almost nothing. This page was last edited on 28 November 2010, at 22:40.